A massive storm is brewing and Seth is ready to head back home. But when he sees an unrequited crush from high school driving an ice cream truck, he must pursue. When they meet, Seth flirts and finally gets what he craved from Aaron all those years ago – and much more – in the back of the truck as they wait out the storm of the century. 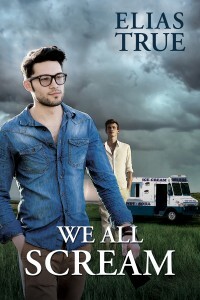 We All Scream by Elias True is trying to straddle that line between erotica and romance. Seth is pondering a newly acknowledged attraction to men, something that simmered in his past but never quite surfaced except in small encounters of the quick look and glance away type with a school friend. Maybe he was kidding himself about girls all along, he thinks. A chance meeting with Aaron, now grown and driving an ice cream truck lets Seth admit his feelings to himself and to Aaron as they drive around in the ice cream truck during a bad storm. The storm and their own desires bring them to a halt, where they make the most of the scant room in the freezer compartment, and confess a few things about the past.